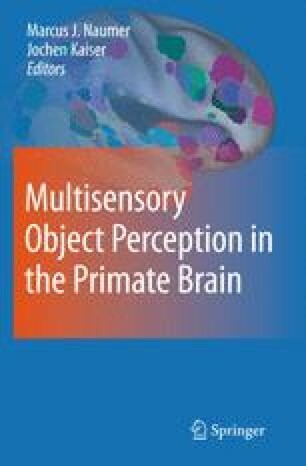 This chapter reviews our research investigating how the processing of unisensory visual objects is impacted by past experiences with multisensory auditory–visual versions of these objects. Single-trial exposure to multisensory objects during an orthogonal old/new discrimination task can incidentally modulate memory performance as well as brain activity. Performance was enhanced when the preceding multisensory stimulus had been a semantically congruent pairing, whereas performance was impaired by pairings with meaningless pure tones. Importantly, these opposing effects occurred despite identical performance patterns with the initial exposure to the objects (and presumably encoding thereof). In terms of brain activity, responses were enhanced to visual stimuli that had been previously encountered in a multisensory context within regions of the lateral occipital cortex beginning just 60 ms post-stimulus onset. Our collective findings indicate that single-trial learning of multisensory object associations occurs incidentally, is distinguishable from encoding processes, persists despite many intervening stimuli, and manifests as differential brain activity at early processing stages within visual cortices. The consequences of multisensory interactions thus persist over time to impact memory retrieval and object discrimination.